At The Popcorn Factory, we love to celebrate every occasion… deliciously! We celebrate the holidays, birthdays, any national food days, and now we are celebrating something totally unexpected and original. With a little research, we found out that March 26th is officially National Make Your Own Holiday Day. So we sat there asking ourselves, what would be our ideal holiday? (FYI- National Popcorn Day already exists). So, we decided the best way to discover a new holiday was to ask none other than our Facebook fans! We gave our fans until midnight to answer the golden question, “If you could make your own holiday, what would it be?” We received almost 100 comments! Our fans shared a variety of made-up holidays that were funny, creative, original, and thoughtful. Here are only a few of our favorites:National Do a Good Deed Day, National Day of Fun, I Get Hugged by Donnie Wahlberg Day, National Smile Day, My Cats Are Gonna Behave Day. We loved every single made-up holiday that our fans shared, but we knew in the end one had to be declared the winner. So, we present to you… National Singing Day! Who doesn’t love to sing? Whether it’s at karaoke with friends, alone in the car, or just when you catch yourself humming your favorite tune, a day of singing will make anyone smile. It’s National Popcorn Month, and The Popcorn Factory® is celebrating by sharing some of our best kept popcorn party planning secrets with you each week in October! Popcorn has long been a staple for all celebrations – from sporting events to gift-giving and movie watching, but popcorn is also a great way to spice up your cooking. Party planning fun isn’t just for grown-ups – this October, let kids in on the fun! Guests of all ages love a snack that’s easy to grab-and-go, and creating a unique trail mix let’s the whole family work together. Making memories as a family has never been tastier, and The Popcorn Factory® has exciting flavors that will make any trail mix something special. As part of the celebration for National Popcorn Month, we are giving away 3 of the Happy Haunting Diva Bag (Item # NA3310). Just post about a paragraph or so below telling us some of your favorite memories with your kids in the kitchen! We’ll pick 3 random people (using random.org) and send them each the Happy Haunting Diva Bag. Make it POP! 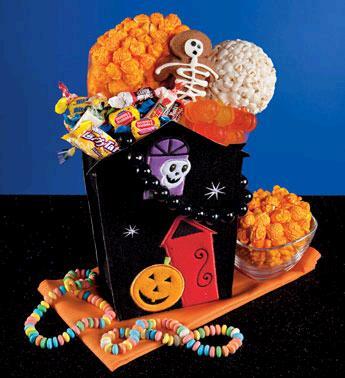 The Popcorn Factory® offers a number of flavors to suit any party planner’s tastes. From classic Butter, Cheese and Caramel corn, to exotic Jalapeño, sweet S’mores and tangy Ginger Teriyaki, The Popcorn Factory® will help you make your trail mix unique – and delicious. Make sure to add popcorn while it is fresh so that it keeps its flavor and texture. Go a little nutty. Nuts offer a hearty addition to trail mix, but be sure to choose flavors that won’t overpower. Consider whether you want to incorporate the salty flavor found in pre-salted nuts or choose a blander version that will add texture and a meaty taste. Be sure to check on any potential allergies among party guests before serving. Sprinkle in seeds. Not only are seeds nutritious, but they make a crunchy trail mix component that is easy to munch. From pumpkin seeds to sunflower seeds, you can roast them, toast them or just toss them in! Crackers, pretzels and cookies – oh my! These carbohydrate options are tasty and come in an endless variety of flavors. Try cheese crackers for an extra punch, pretzel sticks for something a little salty, and crumbled cookies for a sweet treat. Add in fruity fun. Dried fruit comes in all shapes and sizes and has a long shelf life – though you may not need it with a trail mix this yummy! Add in traditional fruits like dried apples, cranberries and bananas, or spice it up with tropical mango and pineapple. Health food stores often have extensive options to work with, allowing each family member to choose a favorite. Sweeten the deal. Candies and chocolates are a great way to add sweetness and texture to your trail mix. M&Ms make an easy, classic edition, but make sure to consider other fun options like snowcaps, crushed chocolate bars or even gummy bears! Keep your trail mix chilled so these candies don’t melt or stick to other ingredients. Half the fun is letting each family member add his or her favorite ingredients, but we’ll get you started with some fail-proof suggestions.